Capacity Building on Tree Nursery Management and Seed Propagation. Green Cameroon on the 26th of January 2017 organised a one day training workshop on Tree Nursery Management and seed Propagation for communities of Woteke(Small Soppo) and Bonakand. 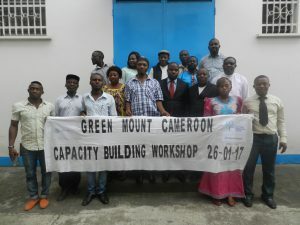 The training came under the Green Mount Cameroon Project started by Green Cameroon since November 2016. The project aims at putting in place a mechanism and know how for the replacement of lost forest in the Mount Cameroon Region. Through the project, alternatives source of wood for general household heating and cooking will be put in place which will reduce the pressure that is presently mounted on our forest by community’s high demand for wood. At the same time community members and students will be educated on the importance of forest and what they can do to preserve it. They will also be given skills through the training that can help them run economic activities through the production of seedlings of important economic tress of the region. Through the project, tree nurseries will be set up in these communities. The tree nurseries will also serve as training grounds for beneficiaries who shall be selected from the villages . When the trees produced in the nurseries are ready, they will be planted in these communities according to the land available. Some trees will also be distributed to community members who have land and are willing to plant and take care of trees. The Training workshop was attended by the Regional Delegate of Evironment, nature protection and sustainable development for the South West Regions. 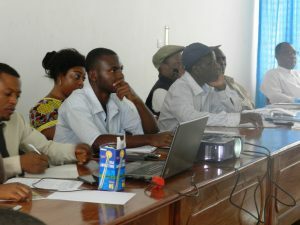 Others present were representatives from other civil society organization from around Buea. Training was given by experts from IRAD(Cameroon’s Center for Agronomic Research) and other resource persons who made sure that community members were equipped with all the necessary skills for establishing tree nurseries in their various communities. It is expected that by the end of the project, more than 3000 trees would have been planted in and around the Mount Cameroon Forest to conserve our rich biodiversity and contribute towards combating climate change in this part of the world. Feel like supporting us? Please click bellow to support our activities and be Part of The Change!! !